This is the story of an Urquhart family of blacksmiths and registrars. The headstones of this one family, along with their in-laws, the Gibson family in Jemimaville and the Campbell farming family of Wood of Brae, comprise all but one of the entire eastern wall of Kirkmichael. And in-laws, the Craigen family of Kirkton, have a substantial stone on the north wall in their own right. And they had another set of in-laws in the same trade: a second blacksmith family, the first Smiths of Newhall Smiddy. In February 2016 the group of three Urquhart headstones were nowhere to be seen. 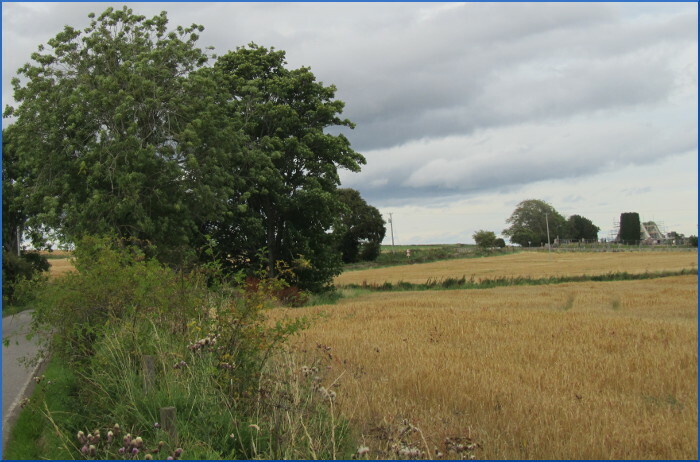 At that time, to the east of Kirkmichael looking across to Cromarty, there was a 10 foot high “hedge” which apparently concealed a wall. 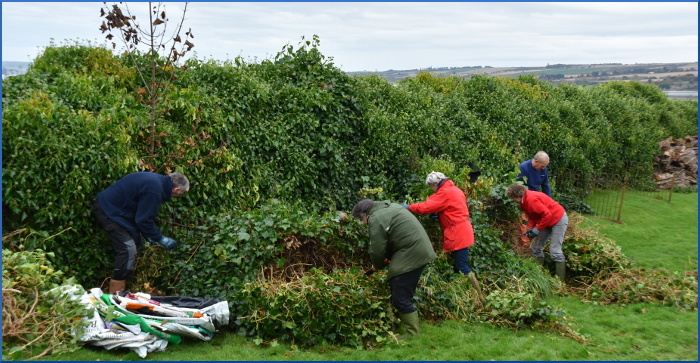 On several sunny frosty Saturday mornings a group of volunteers, armed with power saws, secateurs, hedge cutters and energy, tackled this “hedge” which comprised the thickest, greenest ivy that ever was. 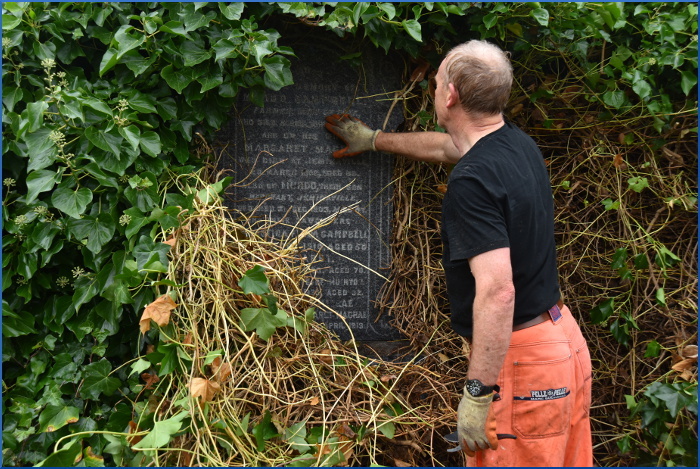 As the work continued there were shouts of– “ I’ve found something!”; and “I think it’s a memorial stone!” and eventually – “I’ve found the wall!” and sure enough as the ivy was slowly cleared (at 6 feet thick and up to 10 feet high this took a fair bit of effort) the old red sandstone wall appeared and these three memorial stones emerged from the dark ivy and stood blinking in the sunlight with their backs to the wall after decades of concealment. So who were the people remembered by these stones? Who erected the memorials in their memory? And is there a family connection between these three stones that stand side beside each other against the east wall? Well yes, there is a connection and it is the family name of Urquhart which links the people commemorated on these three stones, and all but one of the rest of the stones on the east wall of Kirkmichael. 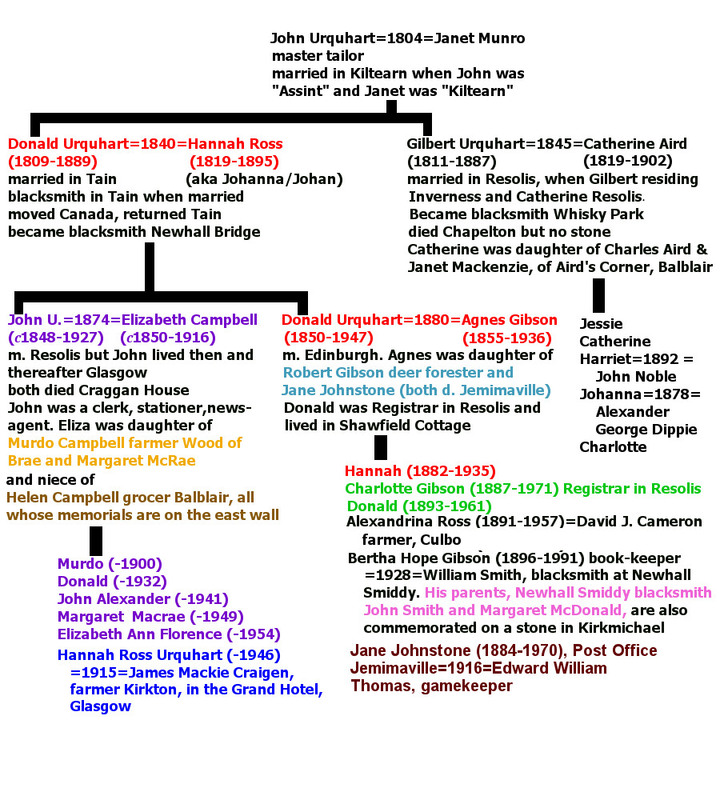 Through researching the death, marriage and birth registers a family tree emerges which links the people to be part of a family arising from the marriage of John Urquhart to Janet Munro in 1804. John Urquhart was a master tailor and although he is not buried here one of his sons (Donald) and three generations are. John Urquhart and Janet Munro had two sons, Gilbert and Donald, both of whom were local blacksmiths. Of the two sons it is Donald’s extended family that is buried and remembered here on these three stones. Although records state that Gilbert Urquhart is also buried in Kirkmichael after he died in 1887, curiously there is no stone to be found when, given his position in society, it would have been expected. Has it been cleared? We are very grateful to descendant Donald Thomas who, having met us coincidentally at a work-party at Kirkmichael one Saturday morning, provided us with an image of his great-great-grandfather Donald Urquhart working at his anvil, with steam billowing out around him.The Thomas connection arose, as Jane Johnstone Urquhart, one of the many daughters of Donald Urquhart, the registrar, son of Donald the blacksmith, married one Edward William Thomas. As Mrs Thomas, she was famous as the kindly Post Office mistress in Jemimaville, and is seen in one of the early postcards of the area at the doorway of the Post Office. Both she and her husband are buried at Kirkmichael, but in the modern section. 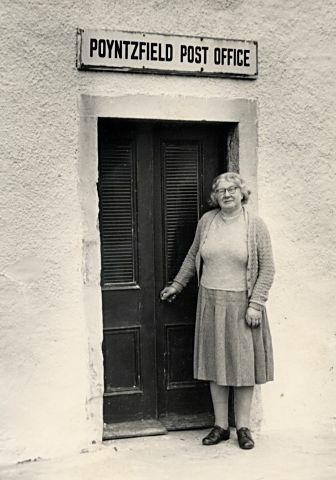 Mrs Thomas outside the Poyntzfield Post Office in Jemimaville in 1935.
and her grandfather Donald Urquhart fifty years earlier. 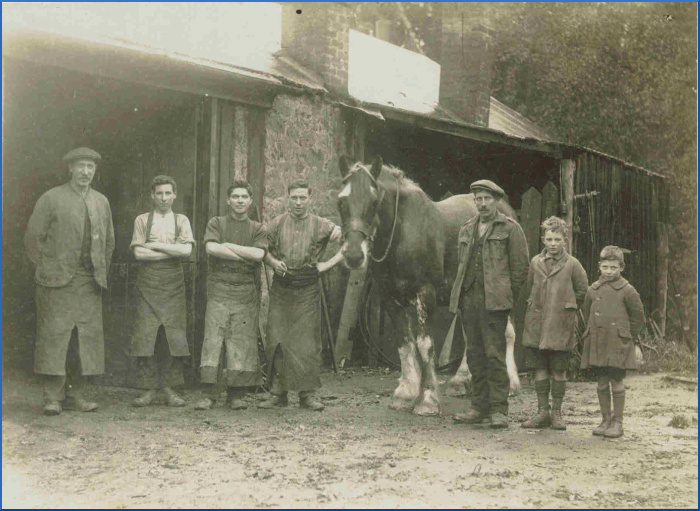 We have some images of Newhall Smiddy a generation later, when William Smith was the blacksmith there. Again, these were kindly provided by a descendant, Patricia Murray from Glasgow, who marvellously still has a Newhall Smiddy account book from this period. The Urquharts made their living as blacksmiths, not a wealthy lifestyle but comfortable enough, and were respected members of the community. 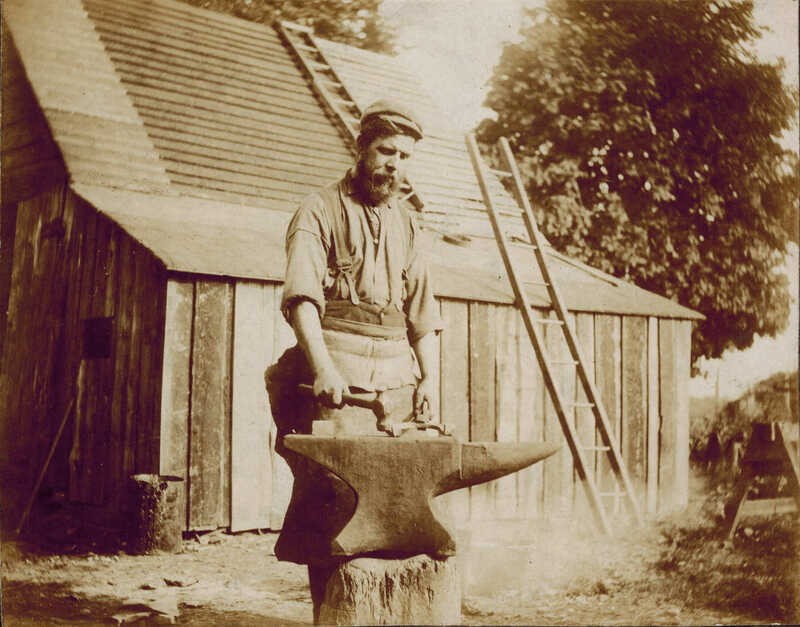 The blacksmith was a vitally important element of the rural community in the 1800s and well into the 1900s. The Newhall Smiddy account book for 1939 shows the range of work carried out at the time – a mass of agricultural maintenance work through to repairing the kitchen range. 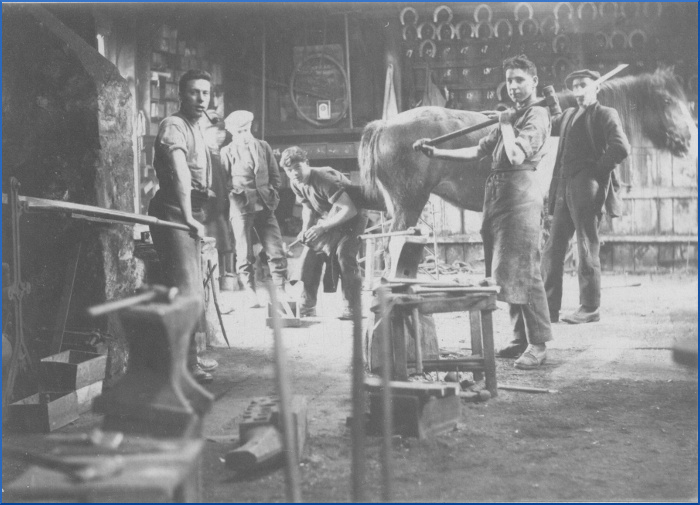 The horses which worked on the farms pulling ploughs and cultivation machinery, and the horses used for transport and carriage, all needed regular attention for new horseshoes. Farm machinery would also be brought to the blacksmith for repairs and maintenance. It is notable that in the close vicinity of Kirkmichael in the late 1800s there were two smiddies – one at Newhall Bridge and the other at Whisky Park (now disappeared, but just at the north end of the road to Gordon’s Mill). Both of these smiddies are a short walking distance from Kirkmichael and both smiddies were run by members of the Urquhart family whom this story concerns. Two generations of Donald Urquhart worked at Newhall Bridge and Gilbert, brother of the older Donald was at Whisky Park. And for many years the Urquharts as blacksmiths or registrars lived at Shawfield Cottage, midway between Whisky Park and Newhall Bridge. The Kirkton smiddy was even closer to Kirkmichael, a few yards away across the road from the site, but had disappeared by this time, although the current owner of Kirkton, Danny Macbean, says that lots of nails appear every time he ploughs this field! The family tree below, drawn up with information from gravestones, death and marriage registers, show four generations of this Urquhart family, and some of their in-laws, particularly those with a Kirkmichael dimension. Research into the lives of this family was notable for the lack of mention in newspapers of the times, so we conclude that this was a most law abiding family (alternatively, they kept whatever they did quiet!) but they were certainly in the public eye. Their names come up in Resolis records more often than any other Urquhart – because Donald Urquhart and Charlotte his daughter were each in turn the Resolis registrar and their signatures adorn nearly every certificate for forty years! As usually the case in Resolis, they had their bynames – Charlotte was known as “Tot” and Donald was, surprisingly, known as “Toddles”. Apparently he would always reply when someone called “Donald, where are you?” with his catch-phrase “Just toddling ben”! 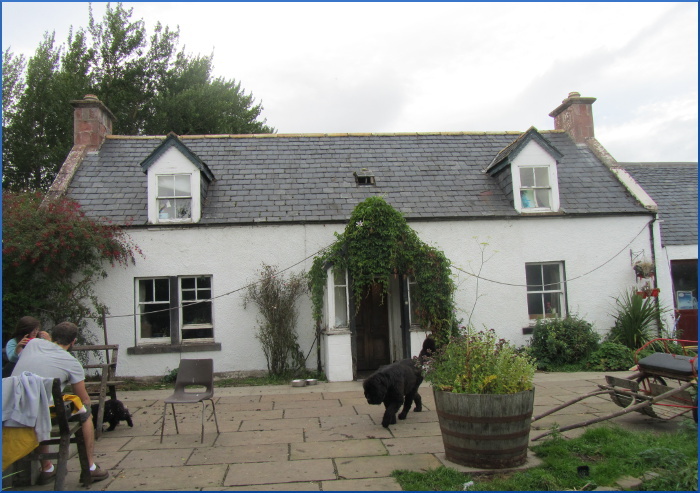 The house at Shawfield is a lovely two dormer, one and a half storey farmhouse like so many others that there used to be in the parish, but now getting rarer. 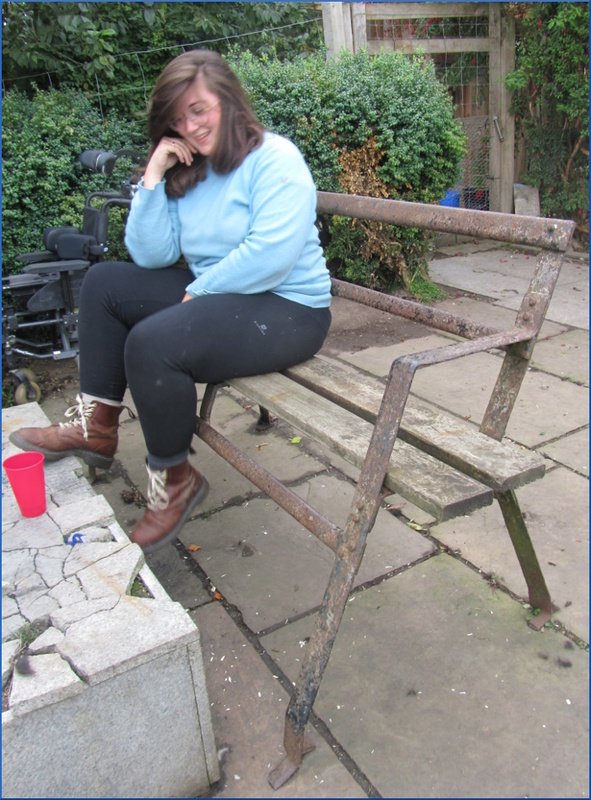 There is one feature round the house that points to the blacksmith origins of the Urquharts who once lived here: a pair of bespoke metal garden seats that still take pride of place in front of the house. As the registrar’s, Shawfield Cottage must feature in many wedding photographs and we would be delighted if a copy of any could be passed on to the Trust! There are additional stones in Kirkmichael commemorating blacksmiths named Urquhart – the Urquhart family at Raddery, who also originated in Resolis. We suspect that this family was also related, but we have not yet been able to confirm the connection. However, we have definitely established the connection of the family with several other families who are commemorated in Kirkmichael. The parents of Agnes Gibson, who married Donald Urquhart, moved to the area, dying in Jemimaville, and are buried close to their daughter, their stone being in between the two Urquhart stones on the east wall of Kirkmichael. The farming family of Murdo Campbell, Wood of Brae, are related, and their big headstone is also in line with the Urquharts, on the east wall of Kirkmichael, as well as that of Helen, Murdo’s sister, who ran a shop at Balblair. One of the Urquharts married James Mackie Craigen, the distinguished farmer of Kirkton, whose substantial headstone is on the north wall of Kirkmichael. And another of the Urquharts married one of the Smith family of blacksmiths of Newhall Smiddy. They lived at Jemimaville and at Gordon’s Mill in their time, and before that at St Martins. There is a stone in Kirkmichael commemorating two of this Smith family (albeit the husband married again and moved out of Resolis). 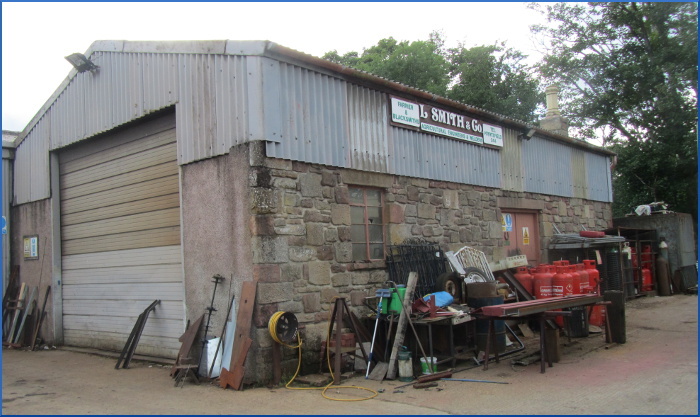 The garage in Contin has been long associated with this Smith family, and a relative, Patricia Murray of Glasgow, was so kind as to provide the Chairman of the Kirkmichael Trust some years ago with copies of photographs of their time at Newhall Smiddy and Jemimaville, and loaned him some of the cashbooks of Newhall Smiddy at the time. In the tree below, memorials to the individuals identified by the same colour may be found on the same stone in Kirkmichael. The Craigen and Smith stones are not on the east wall, but all the others are. In / loving memory of / MURDO CAMPBELL, / farmer Wood of Brae, / who died 5.Dec.1896 aged 88. 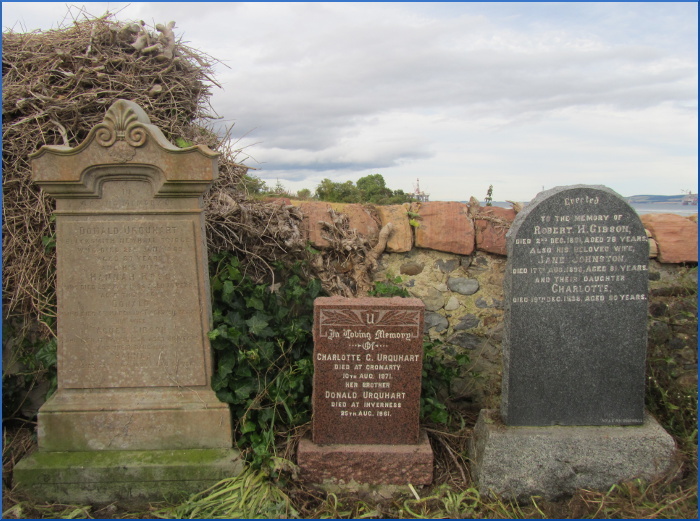 / And of his wife, / MARGARET MACRAE, / who died at Jemimaville 29 March 1902, aged 82 / Also of MURDO their son / merchant, Jemimaville, / who died 21.Dec.1903, aged 47 / And their daughters / CHRISTINA FLORA CAMPBELL / died 25 Oct. 1910 aged 50 / MARGARET, / died 11.Dec.1930, aged 78. / WILLIAM, late of Muirton, / died 9.March 1935, / aged 92. / And of FLORA MACRAE / sister of the above MARGT MACRAE / died at Muirton / 8 April 1919 / In God is my salvation and my glory. The rock of my strength, and my refuge, is in God. PSALM 62. VER.7. 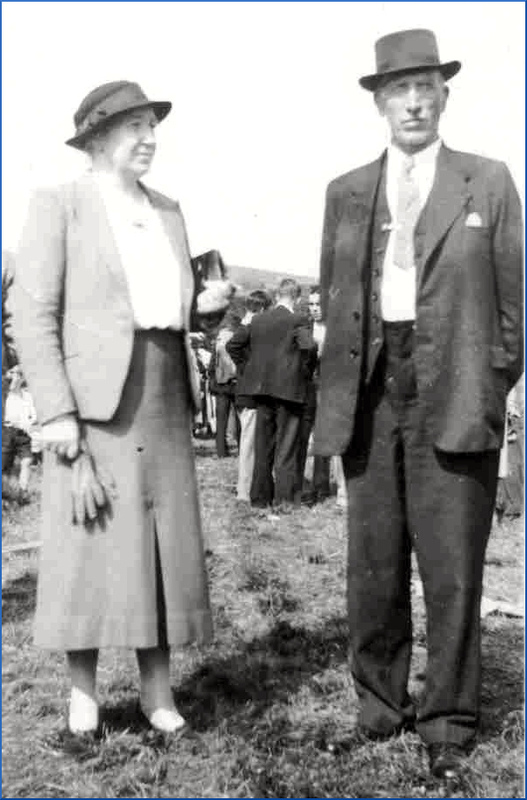 U / In loving memory / of / CHARLOTTE G. URQUHART / died at Cromarty / 10th Aug. 1971. / Her brother / DONALD URQUHART / died at Inverness / 25th Aug. 1961. Erected / to the memory of / ROBERT. H. GIBSON, / died 2nd Dec. 1891, aged 78 years. / Also his beloved wife, / JANE JOHNSTON, / died 17th Aug. 1896, aged 81 years. / And their daughter / CHARLOTTE, / died 19th Dec. 1938, aged 90 years. The ivy, having given up its secrets, has already begun to grow back, but we have now secured the information on this well-respected family of smiths and registrars.